I believe the best thing about this craft beer advent calendar is that I get to try beers I would likely never have an opportunity to try. While I do travel a lot and partake in “beer tourism” as much as I can, there are still some beers that I would be unlikely to find. I believe that today’s beer is one of those. 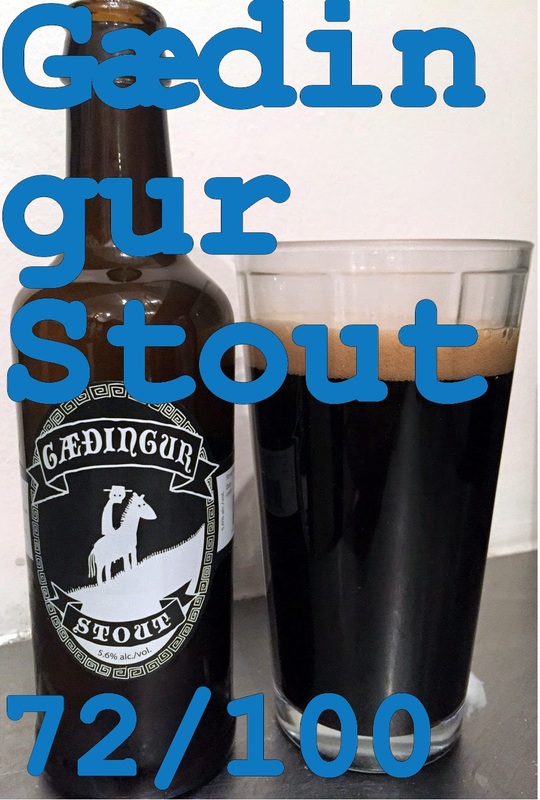 Today’s beer comes to us from a small brewery in the Flókadalur valley region of Iceland called Gðingur Brewing Ltd. This region is located in the northern part of Iceland near the northern coast about 360 km from Reyjavik. The brewery was founded in 2011 with the purpose of using the local flora and Icelandic culture to brew new and exciting beers. The brewery is run by 3 people. Arni is the owner of the brewery and the farm from which they get their ingredients. Birgitte is a partner to Arni in the brewery building. She is also a seamstress. Joe is the brewer in the operation and responsible for the beer that we are going to be trying today. The brewing system that they use at Gðingur Brewing is a British 6 barrel brewery system. While you can create most types of beers using this system, it is a lower yield system that can produce 980 litres of beer at any given time. Given that, they are one of the smaller breweries we have had the opportunity to try. They produce 4 beers at present, a lager, a stout (which we are trying today), an IPA and a pale ale. There stout is brewed using roasted malts from the farm. This is the first stout that we are going to have a chance to try as well. Two firsts today! Stouts are a dark beer made using roasted malts or roasted barley, hops, water and yeast. Traditionally the term stout was used to describe the strongest (most alcohol) porters, typically around 7-8%, produced by a brewery. There are numerous styles of stouts ranging from Dry Stouts, to Porters, and Oyster stouts. While they had lost popularity in the early 20th century after the First World War, they have started to have a bit of an upswing due to the growing popularity in craft beer and breweries. When I think of a stout I think of a beer that is on the exact opposite end of the spectrum from an IPA. Rather than hopping to bring out that floral and bitterness from the beer, malts are used to bring out rich sweet flavours like chocolate, coffee, and caramel. Stouts are a very heavy beer as well often considered almost a meal. I am really excited to try this stout today and see what this small Icelandic brewery has in store! On to the beer! Appearance: Black like the depths of the ocean with 1” of foamy head. Smell: Chocolate, caramel, and smoke notes. Taste: Rich and deep almost like milk with chocolate notes right on the front. Flows into mild bitterness that leaves a smokiness in the mouth. Mouth feel: Silky smooth and full bodied. Overall: The flavours of the stout go well together. The sweetness is definitely there on the front but then it blends into a bitter smokiness on the finish. This stout is well balanced and quite a good example of a stout. Do I like it: I used to drink stouts quite a lot. Their heavy nature tends to make them something I am less like to reach for these days. This is an excellent example of a stout and I did rather enjoy it. Good balance between the sweet and the bitter and I really rather enjoyed the smokiness on the finish. Something I would not likely buy, but would be fine drinking.